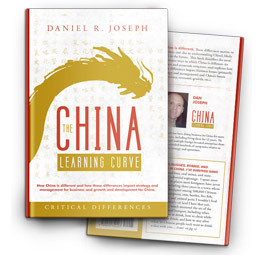 The China Learning Curve provides knowledge, information, and advice to help companies and professionals succeed in China. While other firms might just do things for you, we have invested a great deal of effort in preparing materials and services that help people stand on their own in China, i.e., make their own decisions, manage effectively, and navigate the challenging environment that is China. Our written material includes books, an abundance of downloadable and web-based articles, a newsletter, and training modules dedicated to accomplish this task. To this we add the advice and counsel we can provide. Finding information on China can be an extremely time-consuming task. Often the first step is the most difficult and just getting pointed in the right direction can make a big difference. No single website, newsletter, or book can contain everything there is to know about the largest country in the world. However, taking into consideration the questions and challenges that foreign companies face most often, we have prepared a very comprehensive collection of resources that will help you get the info you need more efficiently. Before you search the web you might want to give our site a look or even give us a call. Often a free phone consultation is all you need. Our experience in China is very practical, hands-on, and direct, i.e., we were in the trenches, not the conference room. Our services are delivered the same way. There is much we can do to help clients succeed. We have a long list of service partners with which we work when assignment requires more resources than we have. In the end our clients find that having us involved keeps any project grounded, moving, and destined to succeed.